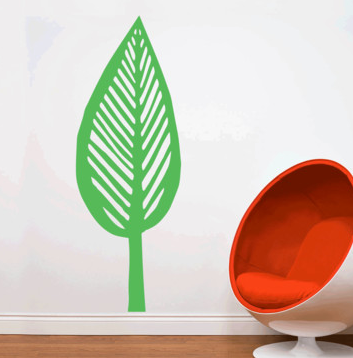 I have blogged before about using decals for decorating. 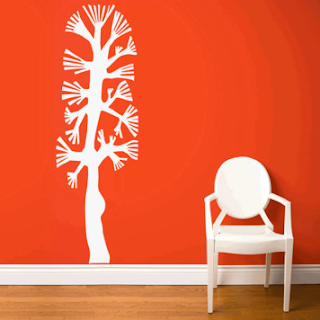 I wish my home had endless walls because I would love to decorate some with decals. This fairly new concept allows an inexperienced designer to experiment with wild ideas. Get a decal, apply it. Like it? Live with it. Grow bored with it? Change it. Hate it? Peel it off. It would have been such a great solution to my daughters' rooms as they grew up. Decals are on my mind again because of a sale going on at fab.com of decals from the Canadian company ADzif. Several just made me smile. I love these trees. 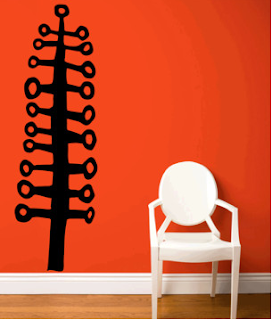 Don't have room for a Christmas tree? Get one of these and tack ornaments on it! Or just the leaf. Imagine a row of these. Reality is my walls are precious space. I live in a passive solar house with large windows and an open floor plan so there is limited wall space. And I have a growing collection of art including my husband's sculptures so no space for decals. Although maybe the upstairs bathroom could use a few!